First Michael Boskin, now John Taylor: there seems be an epidemic of politically conservative economists who used to be technically competent repeating the obviously wrong falsehood that Reagan ushered in an era of “unprecedented” growth. This shows what everyone was supposed to know: we had an awesome performance in the generation following the war (despite very high tax rates on the rich and a very strong union movement); we had a long period of poor productivity performance that spanned the Ford, Carter, Reagan, and Bush I administrations; we then had a revival during the Clinton administration, but even so not up to postwar standards. By the way, I don’t give Clinton credit for that revival; it was about learning to use technology. 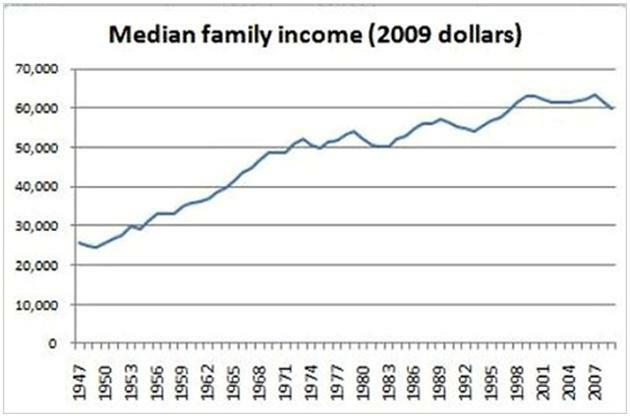 But in any case, there is no hint of a Reagan miracle in the data. So what on earth is going on with people like Boskin and Taylor? It’s not hard to guess; but as Dan Quayle said, a mind is a terrible thing to lose. Krugman says he´s not choosing the dates. That´s because they were quite convenient to his objective of “deconstructing” Reagan! But really, you shouldn´t bundle together the 1970´s with the 1980´s. 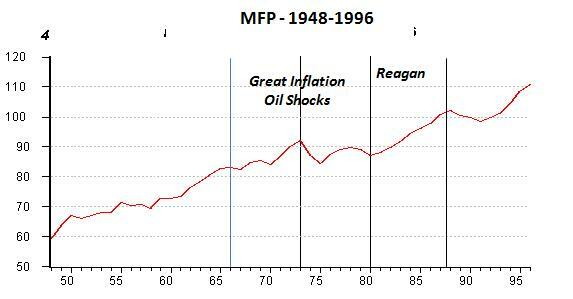 Very low MFP growth from 1966 to 1973 and negative growth from then to 1981. But during the Reagan years things change dramatically and those changes were hidden by the date’s choice made by the BLS that Krugman presents. And we can use the stock market as a “consistency check” on those MFP data. 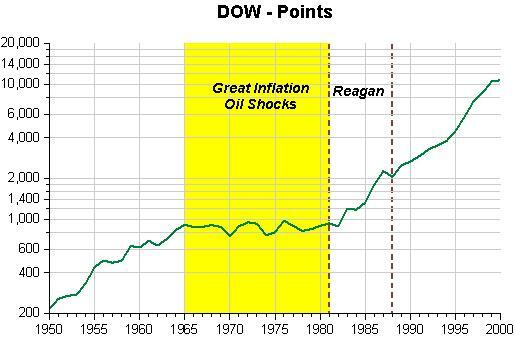 The graph below shows that during the “Great Inflation” and oil shocks period, the stock market was flat (falling significantly in real terms). Ditto for MFP growth. All that changes on the way to the “Great Moderation”. 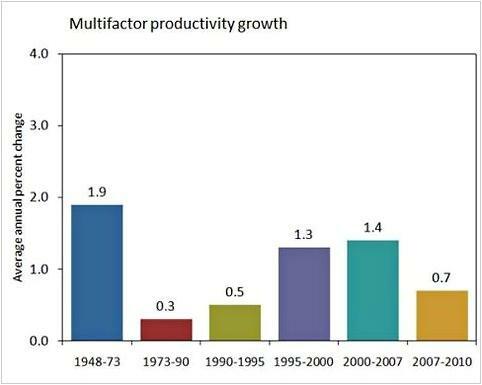 Oh, by the way, GW Bush presided over pretty good productivity growth but terrible job growth, even before the recession. So the overall result was poor. Among the reasons the economy is so vulnerable: Debt-laden consumers with scant savings are prone to slash spending when their incomes drop. Household confidence is more fragile. Individuals are moving less often to find jobs, making it harder for firms to fill vacancies. And the government, for decades the rescuer of last resort with interest-rate cuts, tax reductions and spending increases, has run out of string. 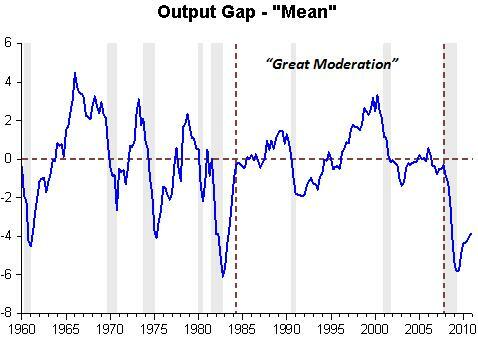 Economists label the late 1980s, 1990s and early 2000s “The Great Moderation,” a period in which the ups and downs of the economy were muted. That epoch is over. James Stock, a Harvard economist who helped coin that label, says that the volatility of economic output, income and consumption looks more like it did 25 years ago. “In this recession and its aftermath, those smoothing mechanisms, those shock absorbers, clearly have been damaged,” he says. The U.S. economy has been expanding for two years now, and forecasters had been expecting it to pick up steam in the second half, powered by robust overseas demand, investment at home by cash-rich companies and a renewed willingness of consumers to spend as they reduce their debt burdens. But Friday’s GDP report and the impact of Washington’s debt-ceiling stalemate on consumer and business confidence as well as on financial markets are raising doubts about that outlook. 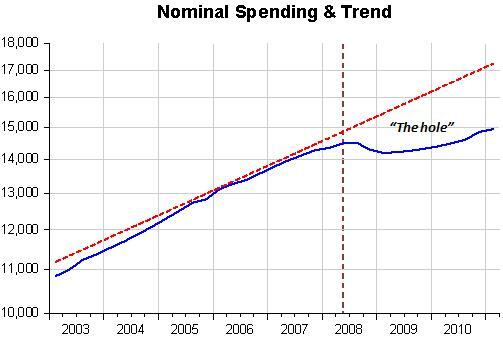 There´s just not enough nominal spending! And yes, the “Great Moderation” is over. Why? Because the best “shock absorber” – nominal spending growing along a stable growth path – got “punctured” and collapsed! That´s the information we get from the BEA release. The picture below provides a clear visual impression. A lot of people have already discussed this topic, so I´ll take a different tack. 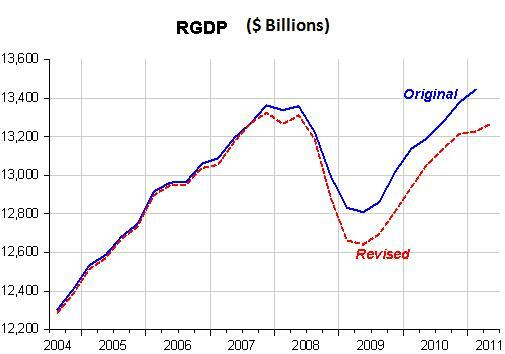 What amazes me is the fact that, led by “brand names” like Krugman, Laura D´Andrea Tyson, Robert Shiller and Alan Blinder, many insist on calling for more fiscal stimulus, even though the quite unproductive previous stimulus only succeeded in leading to the “great debt limit debate”. What about monetary policy? 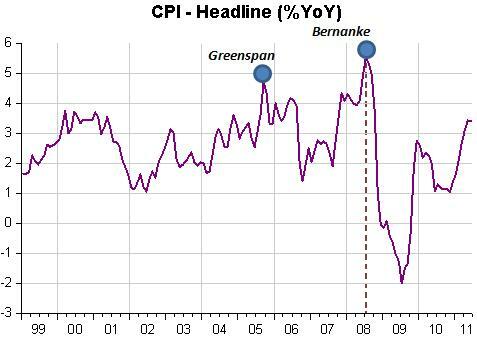 Only a few go down that (quite promising) alley because, after all, rates are effectively at the ZLB making monetary policy inoperative, unless the Fed feels that deflation is on the way, in which case Bernanke will switch the QE button to on! In the picture below, the “Great Moderation” (GM) is clearly defined. Assuming that monetary policy played a significant role in bringing it about, it is not farfetched to assume that the blow-up of the “GM” was the result of monetary policy taking a “wrong turn” in 2008, converting a “normal” recession into a not so little depression. If only we could have a “unified” view of the cause of the crisis – call it the result of monetary disorder – we would be, by this time, a long way into “solving” it. Unfortunately that´s not the case. There is a taxonomy, or “line of causation” that runs from the bursting of the house bubble to the financial crisis followed by the “Great Recession”. And it has become conventional wisdom to consider that in the case of an asset bubble and ensuing balance sheet recession that the recovery will necessarily be “long and painful”. Laura Tyson expresses the thinking of many when she says that the “jobs crisis is the result of the collapse in aggregate demand (AD) that BEGAN with the financial crisis of 2008” (the Lehman affair). If instead we regard both the “financial crisis” AND the “jobs crisis” as the result of the fact that in the fall of 2008 the FOMC´s focus on disruption to financial markets rather than on the contractionary monetary policy in place intensified the recession, we would be closer to a “solution” to the “jobs crisis”. But no. The conventional thinking has it that there has been an unprecedented amount of monetary (and fiscal) stimulus and for some reason they think that only more fiscal stimulus will help job creation. Maybe they are looking at the components of GDP (C+I+G+NX) and regard G as the exogenous variable that can be “freely” chosen to get GDP up. But we should remember that macroeconomics is about aggregates and that the Fed can (if it puts its mind to it) directly influence the path of nominal spending (and, to the extent that it is set on keeping inflation on “target”, easily offset the fiscal stimulus). The recession of 1981/82 provides a good comparison. The drop in RGDP was much smaller, and is associated with only a reduction in nominal spending growth, something very different from what transpired in 2008 when worried sick about the rise in headline inflation due to the rise in oil and commodity prices, the Fed effectively tightened policy (despite “low” rates) causing nominal spending to register the steepest drop since 1938. 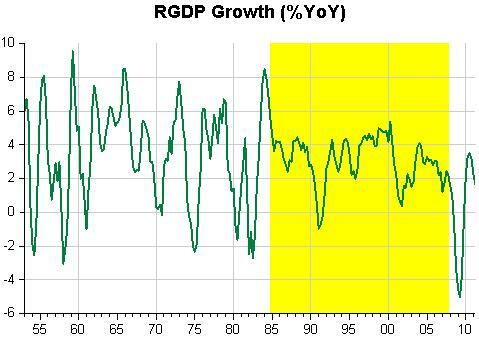 RGDP growth tanked. Employment (NFP) growth also reflects the difference in spending growth in the two periods. 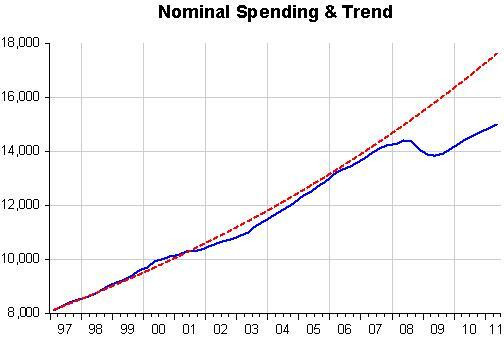 We are far south of the original nominal spending path. While this path may have become unattainable, we are still far south from any reasonable trend path. Getting to it is a choice the Fed can make but that is being held back by the inflation “paranoia” bubbling inside the FOMC. And while the Fed “holds back”, the “hole deepens”. The current policy, like the half-hearted open market purchases of 1932 is a prescription for failure, but the failure is interpreted not as a failure to adopt an expansionary monetary policy, but as a failure ofexpansionary monetary policy. In 1933 FDR proved, despite the skeptics, that expansionary monetary policy does work. Why can’t we learn from FDR? Where are all the historians of the New Deal? Why aren’t they pointing out how FDR used monetary policy to start a recovery at the deepest point of the Great Depression? Given current inflation trends, additional monetary stimulus at this juncture seems likely to raise inflation to undesirably high levels and do little to spur real growth. Factors that have held back the recovery, such as uncertainty about tax and regulatory issues, are largely beyond the power of the central bank to offset. The current recovery as decidedly mediocre, but there are reasons to expect the slowdown will prove temporary. In addition to stretching the definition of “temporary” over the limit, he works, as central bankers tend to do, to absolve themselves from any responsibility. Go complain ro your Congressman! Given that thoughts of high structural unemployment continue to emerge in Fed thinking, the topic bears ongoing scrutiny. So, relative to recent experience, at this point in the recovery GDP growth and employment growth are about average (if we ignore the size of the recession in both measures). The undeniable (and relevant) human toll aside, the current recovery seems so disappointing because we expect the pace of the recovery to bear some relationship to the depth of the downturn. That expectation, in turn, comes from a view of the world in which potential output proceeds in a more or less linear fashion, up and to the right. But what if that view is wrong and our potential is a sequence of more or less permanent “jumps” up and down, some of which are small and some of which are big? I think this is a “scandalous” paragraph. “If we ignore the size of the recession in both measures”! But that´s the crux of the matter, not something to be “ignored”, as I will show. The implication is that perhaps we are closer to potential output than is widely believed. Now, before you roll your eyes, as I am inclined to do, note the CBO estimate of potential output is not the only estimate. Menzie Chinn reminds us of the variety of estimates of potential output, some of which suggest that, at the moment, the output gap is actually positive(!). Others, however, saw the recent configuration of slower growth and higher inflation as suggesting that there might be less slack in labor and product markets than had been thought. Several participants observed that the necessity of reallocating labor across sectors as the recovery proceeds, as well as the loss of skills caused by high levels of long-term unemployment and permanent separations, may have temporarily reduced the economy’s level of potential output . In that case, the withdrawal of monetary accommodation may need to begin sooner than currently anticipated in financial markets. (Emphasis added). Other Fed researchers are more sanguine. Mary Daly at the San Francisco Fed shows that contrary to what a “structural” explanation of high unemployment/low employment would suggest, it is broad-based. Also, according to her, the behavior of wages, which shows a pretty uniform pattern across all sectors is not consistent with a “structural” explanation. I´ll use the “output gap” strategy to show that the reason for high unemployment/low employment is most likely due to lack of demand, i.e. nominal spending. As a measure of the output gap I take the mean of the gap estimated by the CBO and John Cochrane´s “consumption based measure”. The figure shows what transpires. Mostly it conforms with the cycle peaks and troughs determined by the NBER (2001 is a notable exception). 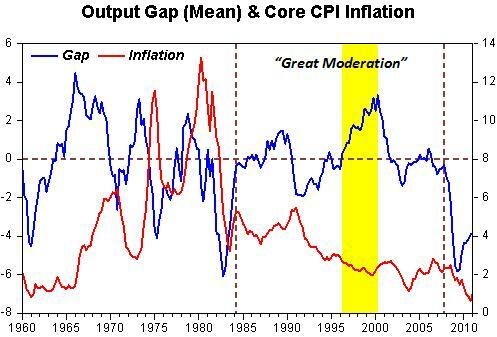 The figure below shows that while in the 1960´s and 70´s the gap preceded and was closely correlated with inflation, that relation disappears during the “Great Moderation”, i.e. inflation was “conquered”. 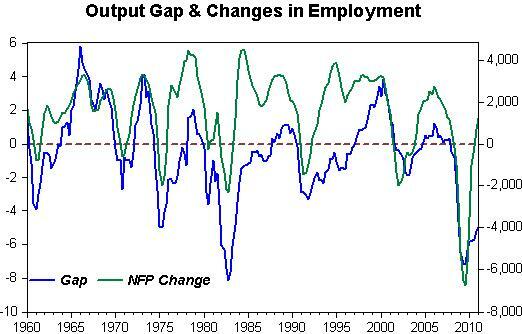 The next figure relates the output gap to changes in employment (NFP). Why, one will ask, for a comparable gap in the 1981/82 recession the drop in employment in the 2007/09 recession was so much bigger? 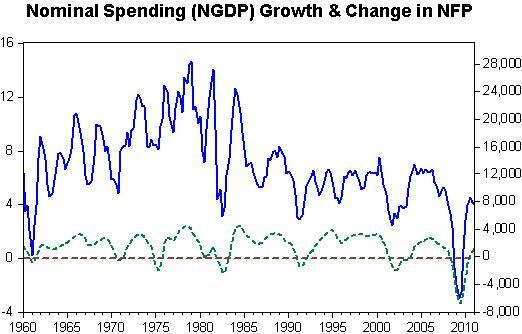 The answer “spits in your face” when you look at the next graph, which shows the plunge in nominal spending growth after mid 2008, something that was last seen in 1938! Since that didn´t happen in 1981, the drop in employment was much smaller and short lived. Also arguing for a largely demand side explanation to the current weak employment numbers is what looks like a pretty obvious link between asset bubbles and full employment over the last decade. As long as households had a mechanism to support demand, achieving full employment was not a problem. If not households, then why can’t another form of demand fill the gap? Economists often flounder around seeking the mysterious cause of the drop in AD after late 1929. Did consumers suddenly stop spending? Or did a change in animal spirits hold back investment? The answer is much simpler, as with any decline in nominal spending either the monetary base declined, base velocity declined, or both. In 1930 it was both. The various components of GDP will respond in different ways to the lower nominal spending under different conditions, but they don’t add any explanatory value. So don´t believe for a minute that the Fed is “not guilty”! By “other policy measures”, read “Monetary Policy”. 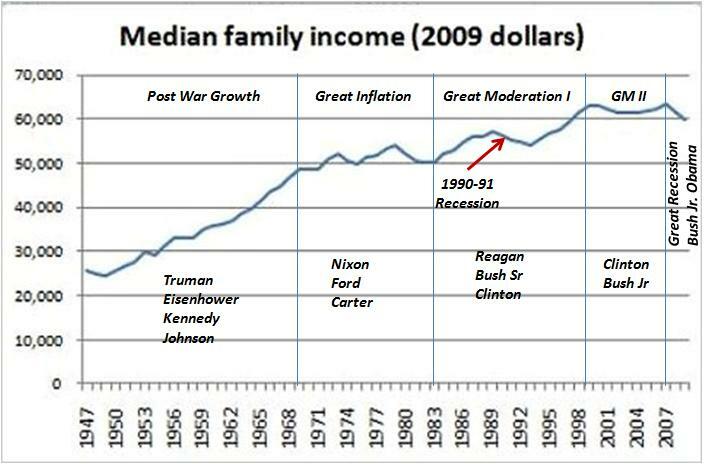 Unfortunately long ago inflation was diagnosed as the #1 problem. It quickly became an obsession that has reaped much harm on the economy, being responsible for the depth and breadth of the ongoing “not so little depression”. The remedy proposed was fiscal stimulus, which is full of undesirable “collateral effects”. So now no “policy” can do any good. “Time”, “do nothing” and “stop government intervening” are the only possibilities! Those inflation spikes were, of course, blips mainly driven by the price of gasoline — as was the recent acceleration of inflation. 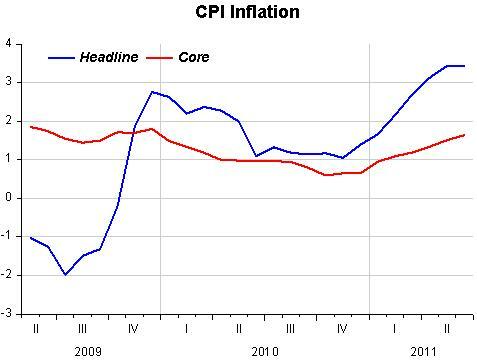 Did I mention that headline prices fell last month, and that most measures of core inflation are falling again? And as long as a Republican was in the White House, everyone was willing to accept their blipishness. 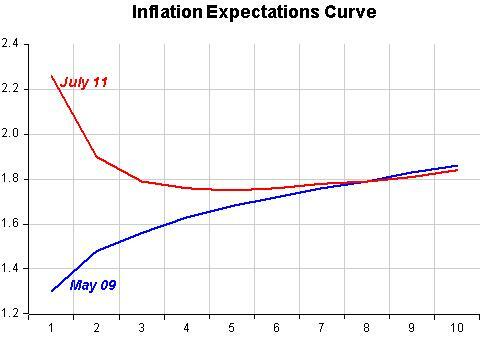 But with a Democrat in the WH, any uptick in prices is a harbinger of hyperinflation. That´s too convenient for Krugman´s prejudices! A more likely interpretation is that the monetary policy of the Greenspan Fed, for whatever reason, was conducive to keeping NGDP evolving close to trend despite the “oil shock”. 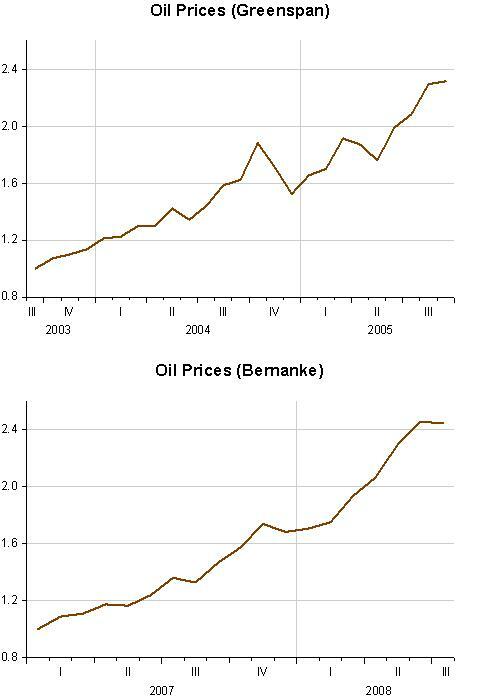 The same cannot be said for the Bernanke Fed. Just check the FOMC Statements from the fourth quarter of 2007 to September 2008, still under the Bush presidency. 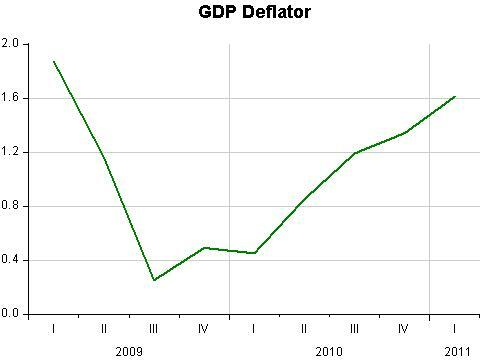 The rise in headline inflation was all that “mattered”. The consequence of all the “inflation worry” was a steep drop in NGDP (for the first time since 1938). IN the 1970s, with inflation rising, I often described the Federal Reserve as knowing only two speeds: too fast and too slow. At the time, the Fed’s idea was to combat recession by promoting expansion, printing money and making it easier for businesses and households to borrow — and worry only later about the inflation that resulted. That strategy produced a sorry decade of slow productivity growth, rising unemployment and, yes, rising inflation. If President Obama and the Fed continue down their current path, we could see a repeat of those dreadful inflationary years.